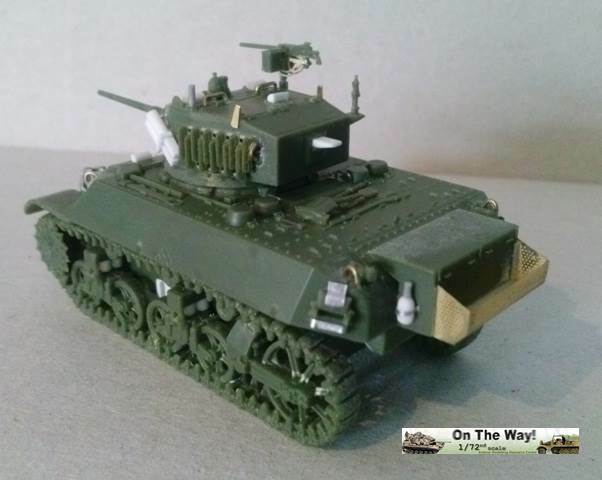 I like this tank family, so I was happy when I received this kit as a present by a friend. The M3/M5 Stuart tank fought on every front: North Africa, Italy, NWE, Far East, Pacific and Russia. 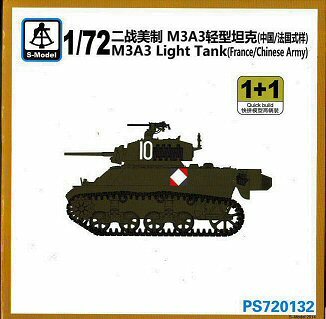 Some tanks were also used by the Germans and the Japanese which captured them, giving us a very wide range of modelling opportunities. 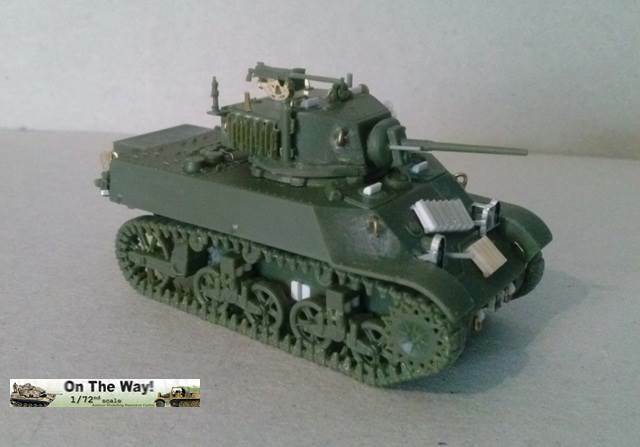 About the Normandy campaign, the M3A3 (aka Stuart Mk V) depicted by S-Model was present in the Recce troops of the British 7th AD and 11th AD, the Canadian 4th (Cdn) AD and 2nd (Cdn) AB. 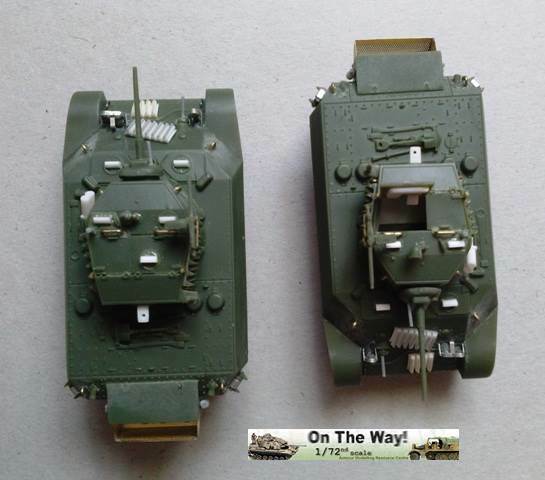 In Mr. Peter Brown’s list there are also 12 Stuart Mk V within the British 6th AB (with 4 Mk VI). Some of them had their turret removed, giving us the possibility to have something different, if one wants to scratchbuild the inner details. Sadly I found very few photos of the British Stuarts in Europe. The kit is composed of two identical olive green moulds, two PE fret, the decal set and the instructions. Clean and crisp, the pieces look very well on the sprue. The only critical points are the joint between the pieces and the sprue. These points are large and strong and removing tiny pieces can cause them to break. 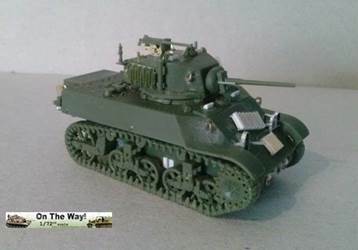 Furthermore a NWE British tank (my choice) had some specific details which are present only in the second release of S-Model Stuart V Kit PS720133 (not yet available when my friend bought the kit with the French/Chinese markings). Assembly didn’t give problems; the pieces fitted very well and no putty was needed. 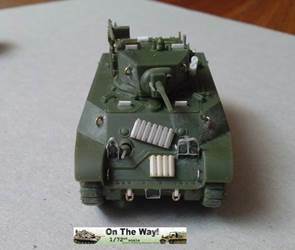 To help me I found this walkaround which luckily is enough to work with on a 1/72 model. 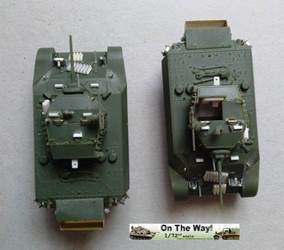 I choose to have two tanks of two British recce troops in Normandy, so I had to add the missing details. 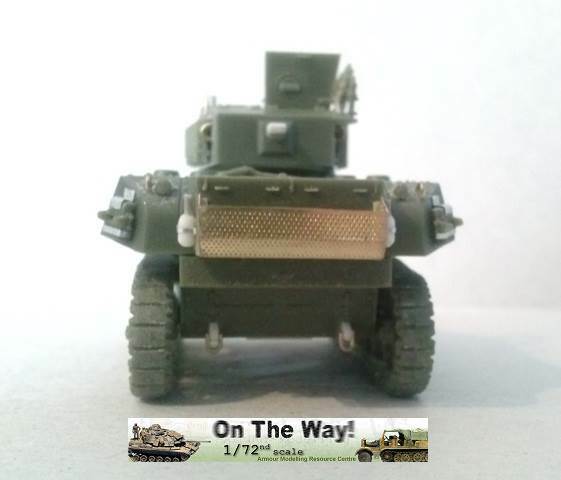 I marked with (X) where the details are present in the British markings Kit PS720133. First of all, I filled the moulding slots for the idler pins with plastic sheet. The 4 lifting rings were made with metallic wire. To ease the work, I glued the exhaust deflector to the upper hull, after having closed its backside. After having glued the turret ring I filed an interlock for the turret because otherwise it will fall away as it would only lean on the hull otherwise. The periscopes are closed; I replaced them with 1.00 x 1.00 mm plastic rod sanded to a triangular section leaving the hypotenuse domed. The 4 towing points are missing. I made them with plastic. To these I added the shackles made with metallic wire. (X) On the glacis of British tanks there were other grousers. 4 stowed horizontally and 7 stowed at an inclination. 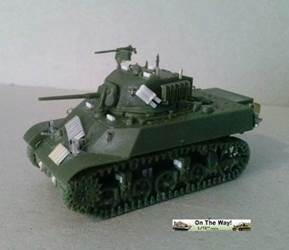 They weren’t alternated as per the turret but were aligned. (X) I scratchbuilt the fire extinguishers on the hull bin sides. The spare track links (A15) were fastened with a holder which is missing. I did it with thin tin strips. Four handles were made with thin metallic wire: two for the engine deck rectangular grate and two for the glacis near the fenders. On the front I added a step made with metallic wire. The PE brush guards shapes are well done, but they are too flat. I choose to make my own pieces and I used the PE fret as a template to make… a template. Around this I wrapped a thin metal strip to make my guards. I also added the rear arms. At the end they could look a bit oversized, but to me the effect looks better than the kit parts. The PE bin attached to the rear box is a bit too wide. I cut off the sides and I glued them to the bin after having made a frame with stretched sprue to have a stronger assembly. Then I reduced the transversal part width and I glued it after bending it. The joints were carefully glued with cyanoacrylate and then sanded to have corners without gaps. I used plastic sheet to close the floor of the rear overhang. The four lifting rings were made with metallic wire. (X) The kit antenna base was placed on the rear right side for aerial “A” and a second one was made for the rear plate. (X) An antenna base was made with stretched sprue on the turret roof for aerial “B”. On the turret sides the grousers were stowed. There were 10 grousers on starboard and 11 on port (alternated like in the kit) placed on their racks which were made with stretched sprue (see on the walkaround). I had to pay attention to the correct sequence. The inner sides of both doors are flat. For the door I glued in an open position I made the inner part of the periscope housing and the pad. On the base I made an interlock to keep the turret on the hull (see above). I made two large handles in front of the crew doors with metallic wire. The periscopes are closed; I replaced them as for the hull. I drilled out the gunsight. 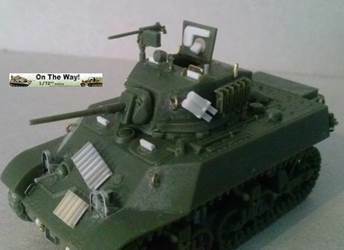 (X) I scratchbuilt the smoke launchers. Each set is made as a single solid piece. Like other “quick building” kit makers, S-Model choose this way to ease the production and the assembly for the war gamers. But we are a bit more finicky. Having a single row of wheels means a double row of guide teeth. S-model made them as a single solid transversal rod and they are not realistic. Here you can find a good way to correct the problem, but it looked a little too complicated for my ability, so I chose another way: I cut off section of the tracks. When I had separated the length I filed off the thickness between guide teeth with a squared file. When hollowed out, I refined them with sand paper. The track length was glued with liquid cement which was use to “wash” the inner side to give a cleaned surface. This work didn’t reach every single tooth leaving solid the ones which are part of the wheels. Anyway, it worked and the finished work looks well. The only real problem was the working time. Between a cut and another (depending where is the cut) I had to wait until the glue had dried to avoid distortion of the set. The inner sprockets are too thick. In this case I followed the way suggested by the preview. On the back of the sprockets on the hull sides there were the elliptical shaped gear covers, which are missing in the kit. To have something which could look like the real thing, I made four large diskettes and other four smaller. To ease the work, they were glued on the sprocket back which mostly hides them. The bogeys are quite well done although solid. 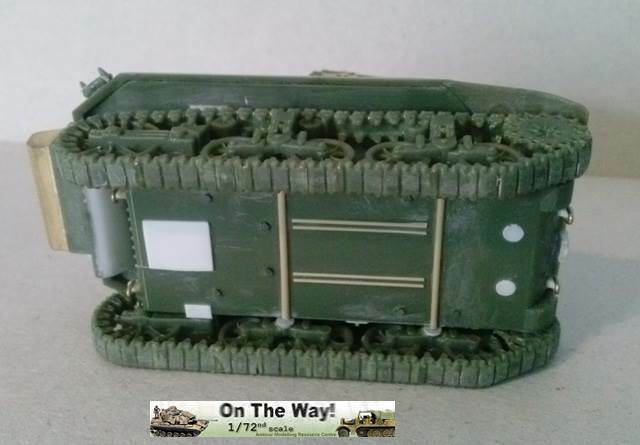 Anyway the springs of the suspension system were very visible and the box like look of them is not realistic when compared to an original photo of the tank. I filed off the coil springs area and made them with two rod sections each. 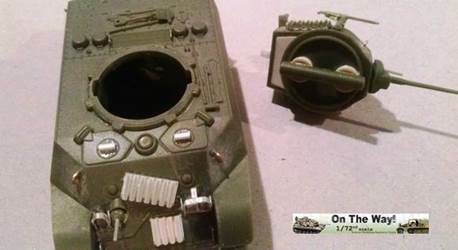 The lower inner sides of the bogeys are not connected to the hull sides; I glued a round plastic section shim to each. To get a better result I should have to hollow out the idler arms, but I didn’t find a good way to do this without replacing the idler wheels, so I had to leave them as they are. 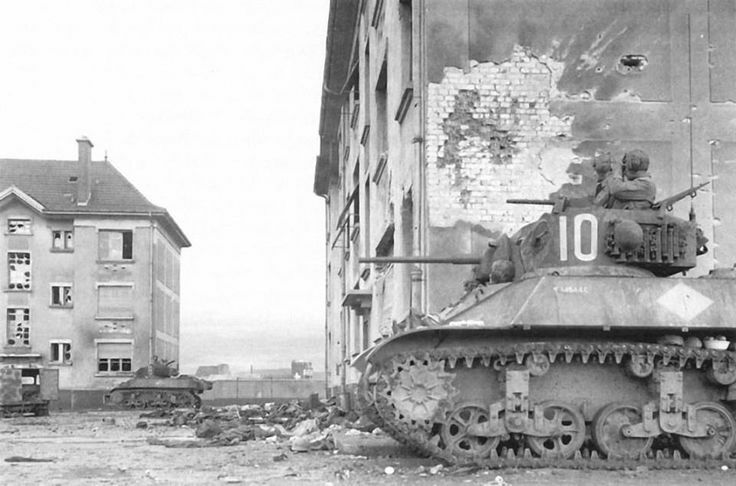 10 - a French tank of the 5e DB in Alsace, November 1944 (visible here). I’m not interested by either. Anyway, the French one looks like it is missing something to me. My Normandy tanks will receive their markings from other sources. 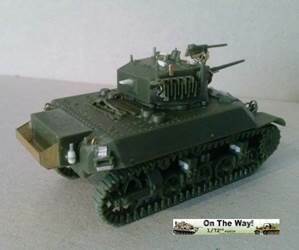 The kit looks to be a half way point between a display model and a simplified quick building kit with the only simplified parts being the wheels and track sets. 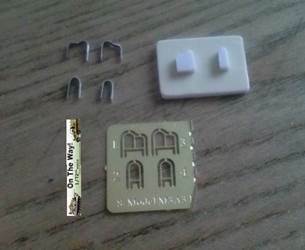 The remaining parts are what one can find in a good display kit, with also some PE parts. An aftermarket set could make the difference, however the improvement work is not so hard and at the end the only parts I wasn’t able to improve were the idler wheels.